Plastic top corner with rubber grip. Push button for front loading mechanism. 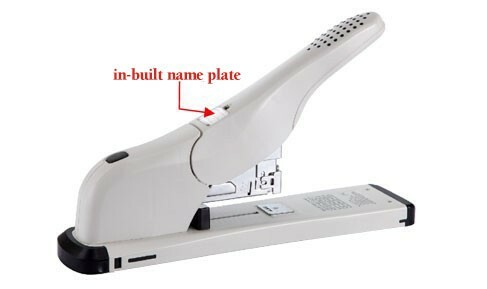 Suitable for staple use 23/8-23/13 build in name plate. Staple use upto 23/13 for 9mm stack of papers. One strip having 100 staples of 23/6-23/13x100 can be loaded at once. Indicate maximum insertion paper depth. The base length of depth is 70mm and breadth is 337mm.